On October 31, 1517, Martin Luther nailed his 95 Theses to the door of the Castle Church in Wittenberg, Germany. This year the Protestant world is celebrating the 500th anniversary of that event. On May 8, General Conference president Ted Wilson, addressing the faculty of Middle East University, cited Ellen White who predicted that Seventh-day Adventists would carry that Reformation on until the end of time. Beyond that, he quoted 1 Timothy 1:7: “For God has not given us a spirit of fear, but of power and of love and of a sound mind.”1 With that good advice in mind, we will begin our study of the history of authority in Adventism with Luther and his struggle with the Roman Church. Given my topic, many people would expect me to deal with the theme of the development of ecclesiastical authority in Adventism. But the authority of the church in the denomination is contexted within Adventism’s understanding of the authority of the Bible and that of Ellen White. As a result, I have divided my presentation into three parts: Adventism’s approach to biblical authority, Ellen White’s thoughts on authority, and the development of authoritative structures in the Seventh-day Adventist Church. At this point, it is important to realize that Adventism’s primary Reformation heritage is not Lutheranism or Calvinism but Anabaptism or the Radical Reformation, which in essence held that the magisterial reformers had not been consistent in their Bible-only approach. For the Anabaptists it was wrong to stop where Luther, Calvin, or Zwingli did theologically. As a result, they moved beyond such teachings as infant baptism and state support of the church and toward the ideals of the New Testament church. In summary, Adventism at its best in 2017 stands on a firm platform of the Bible only as the rule of faith and practice. One of the unfortunate features of Roman Catholicism and many other Christian movements in history is that when they could not establish their claims from the Bible they were tempted to use threats and force backed up by ecclesiastical authority. That is an astounding conclusion, since the lesson from the Jerusalem Council is exactly the opposite. In Acts 15 the diversity had already been taking place. The Council met and validated that existing diversity, which previously had been blessed by the Holy Spirit. But, as we will see, that reversal of fact is only one problematic aspect of the September 2016 document’s use of Acts 15, when viewed from the perspective of what has actually taken place in recent Adventist history. But before treating that history, it will be helpful to examine Ellen White’s remarks on the Council. In Acts of the Apostles she notes that “it was the voice of the highest authority upon the earth,” a descriptor she would later apply to General Conference sessions. Those words are also found in The Story of Redemption, where the section on the Council has the editorial title of “The First General Conference.” The section notes that the Council was called because the Jews did not believe that God would authorize a change from traditional practices. But, she concludes, that “God Himself had decided this question by favoring the Gentiles with the Holy Ghost” to demonstrate the need for change. In short, God had given the Spirit to the Gentiles in the same manner that he had to the Jews.9 Thus unity in diversity was approved. The point about the Spirit settling the matter is an interesting one since at the 2015 General Conference session there was no testimony from female pastors regarding how the Holy Spirit had blessed their ministries in the same way as that of males, the very type of testimony that had led to breaking the deadlock over accepting Gentiles in Acts 15 (see vv. 8, 9) and had reinforced many members of the General Conference appointed Theology of Ordination Study Committee to approve by a strong majority the concept of allowing those divisions that desired to ordain females to move forward. In that sense the decision-making process of Acts 15 was not followed. A further point to note is that in Acts 15 all of the decisions had a clear biblical base. The same cannot be said of the 2015 General Conference session vote, as we will see in our treatment of Adventism’s ecclesiological authority. Several other points should be made in relation to Acts 15. First, Paul later opted not to follow the Council’s decision of Acts 15:20, 29 in regard to abstaining from food sacrificed to idols. That is evident from 1 Corinthians 10:23-30,10 where in verses 25 and 27 he claims that it is permissible to eat meat offered to idols if it does not offend anyone, a ruling that goes directly against Acts 15 with its categorical prohibition. So we find Paul adding conditions and making exceptions based on cultural context. What Paul could have done was to announce that the first General Conference in session had passed a universal rule and that he had a copy of the letter to prove it. That would have solved the problem and saved Paul a lot of ink and explanation. In actuality, we do not find Paul in any of his letters referring to the Acts 15 Council, even though it could have been helpful to him. A second point that should be noted is that the Seventh-day Adventist Church does not follow the “universal” rulings of Acts 15:29, 20 in that it does not prohibit the eating of blood by requiring flesh eaters in its midst to eat only kosher meat that has been killed in the proper way so that the blood is drained completely from it. So we find the Adventists being similar to Paul in interpreting and discarding aspects of the ruling largely based on cultural considerations. With those facts in mind, it can be argued that the real lesson to be gained from Acts 15 is one of unity in diversity, with Jewish and Gentile Christians having freedom to follow differing paths because the Holy Spirit fell in the same way on both groups. What is most interesting in the General Conference’s repeated use of the binding and loosening verses is that it consistently uses Matthew 18:18 and neglects Matthew 16:19. That is understandable since Matthew 16:18, 19 not only sets forth the binding function of the church but also contains Christ’s remark about Peter and the rock upon which Christ will build His church and the keys of the kingdom, making it the foundation of Roman Catholic ecclesiology. With that in mind, it is easier to see why the General Conference documents emphasize Matthew 18:18 but avoid the parallel passage. There is not much to be gained in using Catholicism’s favorite passage even if it makes the same essential point. But a fascinating aspect of the use of those verses is that both the Adventists in their recent documents and the Roman Catholics have misread the text in the same manner for similar ends. One interesting point related to the General Conference’s use of Matthew 18 is that it is not the church that calls pastors but, according to Ephesians 4:11, God. All the earthly church can do is bind or ratify God’s decision through commissioning or ordaining. That is biblical, as is the laying on of hands in recognition of God’s call. What is not biblical is ordination as we know it. In fact, our English word “ordination” does not derive from “any Greek word used in the New Testament, but from the Latin ordinaire.”15 As a result, modern translations tend to use such words as “appoint” or “consecrate” where the KJV uses “ordain.”16 The word “ordination” as Adventists use it is not a biblical teaching but one that finds its roots in the early and early- medieval church.17 From that perspective, the distinction between ordaining and commissioning is a word game of no biblical substance. At the very heart of Ellen White’s understanding of religious authority was the place of the Bible. “The Bible,” she wrote, “must be our standard for every doctrine and practice. . . . We are to receive no one’s opinion without comparing it with the Scriptures. Here is divine authority which is supreme in matters of faith. It is the word of the living God that is to decide all controversies.”18 That thought undergirded Ellen White’s theology throughout her long ministry. A second major topic related to Ellen White’s historic view on authority has to do with the General Conference as God’s highest authority on earth. That topic will be treated in the next major section of this paper, which deals with ecclesiastical authority in Adventism. Given the amount of heat generated in some Adventist circles on the topic of ordination, one might surmise that somehow power and authority is being transferred to the ordinand. While that might do for Roman Catholic theology, it does not hold up in either the Bible or Ellen White. To the contrary, just as baptism does not erase original sin but is rather an outward symbol of a changed heart, and just as the bread and the wine are not magically transformed into the actual body and blood of Christ in the sacrifice of the Mass but are rather symbols of what Christ accomplished on the cross, so it is that the laying on of hands in what has come to be called ordination does not confer power but is symbolic in recognition of the power already conferred by God in the calling and empowerment of a pastor. What counts is not the act of ordination but the calling of God. And the Seventh-day Adventist Church has for many years recognized that God calls both men and women to pastoral ministry. The only difference is that the church has opted to call one ordination and the other commissioning. Such non-biblical verbal gymnastics must lead the angels to scratch their heads in bewilderment. However, it all seems to be clear in Adventist policy. But at least Ellen White is forthright on the topic. No power or authority is transferred in ordination. That is a product of the history of the church. And, in the words of the Revelator, much of the Christian world seems to be following after the beast (Rev. 13:3, NKJV) on the understanding and importance of ordination. So far this paper has examined Adventism’s approach to biblical authority and Ellen White’s historical approach to authority. Thus the stage has been set for an examination of the denomination’s struggle to find and be faithful to a balanced and biblical view of ecclesiastical authority. Looking back at early Adventism, no one could have predicted that by mid-twentieth century Seventh-day Adventism would be the most highly structured denomination in the history of Christianity, with four levels of authority above the local congregation.28 The plain fact is that the earliest Adventists feared structured churches. And with good reason. That fear is nicely expressed in the October 1861 meeting that saw the establishment of the first local conference. Part of the discussion at that historic meeting had to do with developing a formal statement of belief. John Loughborough took the lead in the discussion and laid out five progressive points that nicely express the attitude of most of his audience. “The first step of apostasy,” he noted, “is to get up a creed, telling us what we shall believe. “The second is, to make that creed a test of fellowship. “The third is to try members by that creed. “The fourth to denounce as heretics those who do not believe that creed. Those points are informative to those of us who live 150 years later. While White feared a backward looking rigidity that would inhibit the progressive dynamic in what the early Adventist’s thought of as an ongoing present truth, Loughborough expressed fear of persecution for those who did not line up with official positions. The fear of organized denominations as persecuting Babylon stands at the foundation of early Adventist attitudes in regard to organizing as a church. But in the 1850s James White began to emphasize an alternate biblical meaning of Babylon. In July 1859 he let it be known in the most descriptive language that he was sick and tired of the cry of Babylon every time that anyone mentioned organization. It is impossible to overestimate the force of White’s redirection of the emphasis from Babylon being primarily seen as persecution to that of confusion. That new emphasis went far toward paving the way for the Sabbatarians to organize as a religious body, legally own property, pay pastors on a regular basis, assign pastors to locations where they were needed, and develop a system for transferring membership. In the end, developing church organization had one major end. Namely, to expedite the mission of the denomination. Thus he had come to a new hermeneutic. White had moved from a principle of Bible interpretation that held that the only things Scripture allowed were those things it explicitly approved to a hermeneutic that allowed for developments that did not contradict the Bible and were in harmony with common sense. That shift was absolutely essential to moving forward in the creative steps in church organization that he would advocate in the 1860s. Without the radical shift in hermeneutical principles there would have been no organization among the Sabbatarians above the local congregation. But the new hermeneutic allowed them not only to organize but to create a structure that made it possible to take their unique message to the ends of the earth. Mission, we must note again, was always behind the Adventist mentality as it sought to dynamically move forward on the basis of a hermeneutic that allowed those things that did not contradict the Bible and were in harmony with common sense. That conclusion lines up with Ellen White’s statements across time. 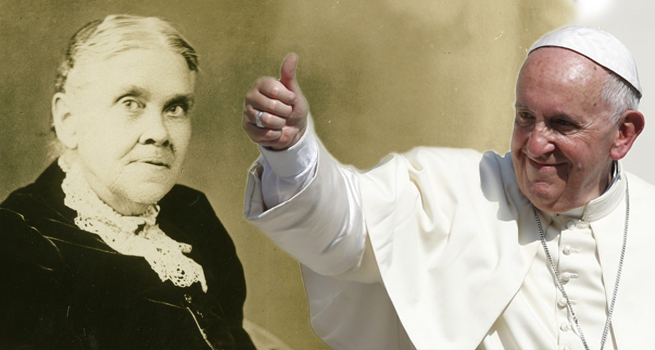 In fact, she specifically spoke to the point in a manuscript read before the delegates of the 1909 General Conference session in which she responded to the schismatic activities of A. T. Jones and others. The second round of organizational refinement took place between 1901 and 1903,45 when several major changes were made. The two most important were the replacement of the autonomous auxiliary organizations (such as those that controlled education, publishing, medical, Sabbath school, and so on) with the departmental system and the development of union conferences to stand as intermediary administrative units between the General Conference and the local conferences. Both of those innovations had been experimented with in South Africa and Australia before the 1901 session. And both of them had been developed in response to regional mission needs. And both were developed in opposition to General Conference pronouncements and procedures. General Conference President O. A. Olsen thought he saw “elements of danger” in the departmental systems and told A. T. Robinson in South Africa not to develop departments.46 But it was too late. Because of the large amount of time it took to communicate from North America, Robinson had instituted the program and found out that it worked. Here we need to remember an important lesson in the history of Adventist organization. Namely, that both of the major innovations adopted by the 1901 General Conference session were in response to regional mission and both were developed in opposition to General Conference counsel. But they worked. The major lesson is that without the freedom to experiment Adventism would not have its present system of organization. A case in point in contemporary Adventism is the Southeastern California Conference, which has an ordained female president, in spite of the wishes of the General Conference. The situation looked good in 1901 with the union conferences in place. But the push for both unity and uniformity by the General Conference over time would erode the accomplishments of 1901. The most significant move along that line, as we will see, took place at the 1995 General Conference session. The erosion of the ideal of unity in diversity had, unfortunately, already begun soon after the 1901 session. The following two years would witness a major struggle for the control of Adventism between General Conference president A. G. Daniells and J. H. Kellogg, the powerful leader of the denomination’s medical work. A broad study of the 1888 crisis indicates that the most serious problem troubling the Minneapolis meeting was the high-handed assertions of position and manipulation of data by the president and his colleagues.62 It should be noted in passing that the theme of Butler’s 1873 Leadership was “union” and “order.”63 Unity was the goal in that document and the same preservation of unity would be Butler’s goal in the manipulation of data in the 1888 period. But that would begin to change in the legal documents of the denomination in the 1980s and come to a climax in the 1990s and the first two decades of the twenty-first century. The 1980s witnessed the development by the General Conference of a “Model Union Conference Constitution and Bylaws.” In 1985 the Working Policy stated that the model should be “followed as closely as possible.” But by 1995 the same section would note that the model “shall be followed by all union conferences. . . . Those sections of the model bylaws that appear in bold print are essential to the unity of the Church worldwide, and shall be included in the bylaws as adopted by each union conference. Other sections of the model may be modified.” In 1985 the model stipulated that all “purposes and procedures” of the unions would be in harmony with the “working policies and procedures” of the General Conference. By 1995 General Conference “programs and initiatives” had been added. And in 2000 all “policies” was included. All of those additions were in bold print.67 Thus between 1985 and 2000 the Working Policy not only erased the 1901 model of unity in diversity set forth for unions in the Ellen White led drive for decentralization, but had become progressively more engineered toward centralization of authority in a drive for unity with less and less diversity. The challenge for the General Conference in the mid-eighties was to get existing union conferences to adopt the new model. In that, they succeeded in some unions and failed in others. That unvarnished threat indicates that the type of actions threatened by the General Conference in 2016 have a history. And that history is solidly rooted in the tightening up of the relationship between union conferences and the General Conference in the modified Working Policy. The 1990s would witness the move by the General Conference leadership to centralize its authority move into high gear. Robert Folkenberg, the new General Conference president, faced with the important but daunting task of maintaining order in a massive world church, established in 1991 the Commission on World Church Organization, which met several times until its work was completed in 1994. The successful aspects of the Commission’s work went to the 1995 General Conference session. Others fell by the wayside. All of them were aimed at the centralization of authority. Among those that fell by the wayside was an attempt to take away the exclusive right of local congregations to disfellowship members. The stimulus for the move was the fact that Des Ford of Glacier View fame and John Osborne of Prophecy Countdown still held church membership in sympathetic congregations that would not disfellowship them. Osborne’s case is interesting since, although he lived in Florida, his membership, being threatened there, had been rescued by the Troy, Montana, church where he had never lived. At that point those in the General Conference who wanted action threatened to disband the church. I still remember getting a late evening phone call from one of the congregation’s leaders telling me that they had an ultimatum: either disfellowship Osborne or face dissolution as an Adventist church. The congregation was disbanded, but Osborne’s membership had been rescued by the Village Church in Angwin, California. Interestingly enough, it was the Pacific Union College Church in the same city that held Ford’s membership. Neither congregation responded to the call to disfellowship the men. But the solution seemed obvious—give higher levels of the church structure the prerogative of disfellowshipping local church members.69 Ideally, the idea ran, the same sort of logic could be used to remove ministerial credentials and disband congregations. Thus the “higher” levels would have more control over situations that they believed the lower levels were not handling correctly. The most successful aspects of the Commission’s recommendations saw passage at the 1995 General Conference session. That session not only witnessed a further tightening of the control measures embedded in the model constitutions, but also passed legislation that allowed for noncompliant unions, conferences, and missions to be disbanded if they did not come into line with General Conference policies and initiatives. Since 1995 the General Conference Working Policy has contained a new section titled “Discontinuation of Conferences, Missions, Unions, and Unions of Churches by Dissolution and/or Expulsion.”71 Utilizing the ever-more centralizing requirements of the model constitution, the new section (B 95) proclaims the power to disband any union, conference, or mission that is out of harmony with General Conference policy. With what has become policy B 95 in place, the General Conference had arrived at the point where it could threaten the existence of two North American Division unions in September and October 2016. Ted Wilson, then president of the division encompassing Russia, was reported to have said at a commission meeting that he would have difficulty getting some of the recommendations accepted in a country that had just exited communism.74 That, needless to say, was a pertinent insight that might have meaning in 2017 for those who understand the significance of the Protestant Reformation. One final point needs to be made in regard to the Governance Commission. Namely, that some person or persons “high up” in the General Conference apparently manipulated the data so that the final form of the commission report did not line up with what was voted. Folkenberg did not indicate “how and why it came into final form without discussion and a vote from the commission.”75 The manipulation of data would reappear in 2015. We now move to the 2015 General Conference session as a final building block that led up to the noncompliance threat issued at the 2016 Annual Council. The major event of the 2015 session, of course, was the vote to not allow divisions the option of ordaining female pastors. That action is clear enough. But the way it took place leaves open the question of whether the action represents a “voice of God” vote enacted by the General Conference in session. To grasp the significance of that issue we need to go to the early presidency of Ted Wilson when he established the Theology of Ordination Study Committee (TOSC). This worldwide panel of over 100 scholars and non-scholars who had a burden on the topic met in 2013 and 2014 with the aim of informing the church on ordination issues at a scholarly level so that an informed vote could take place in 2015.76 The study cost the denomination hundreds of thousands of dollars. As the General Conference Secretariat noted, “voices from around the world from all sides were heard; the arguments and supporting documents of all perspectives were made freely available online. . . . The process was unmatched in both breadth and depth.”77 All those points are true and were included in a document that suggested penalties for those unions that had not come into line with the 2015 vote. All of this is forcefully outlined in a document entitled “A Study of Church Governance and Unity” developed by the General Conference Secretariat in September 2016. But, unfortunately, the “Study” in actuality set the stage for disunity in that it inflated the document’s value for its own purposes but did not report the findings of TOSC. That maneuver is merely the tip of a nasty iceberg. Had the actual findings of TOSC been reported, the vote, in all probability, would have been different. After all, a 10% shift in the vote would have changed the outcome. The final tally at the General Conference session in San Antonio was 977 (42%) in favor of flexibility in ordination to 1,381 against, a remarkably close vote considering how the process was handled. William Johnsson, retired editor of the Adventist Review, has pointed out that 2015 will go down in history as the most divisive General Conference session since 1888.87 And he is correct. What is interesting is that in both sessions, top people in the General Conference manipulated data. In the 1888 era it was president G. I. Butler, who Ellen White faulted for his desire to decide what information came to the delegates.88 One can only guess who decided to suppress and manipulate the reporting of the findings of TOSC in 2015, but the only possibility is a few people near the top of the General Conference structure. The significance of the manipulation and suppression of crucial data that had been produced at immense expense for the purpose of informing the church has vast implications, especially since Ellen White, as we saw earlier, repeatedly claimed in the 1890s that she no longer held that the General Conference was the voice of God because it’s decisions were really the decisions of a few men. That is exactly what we find in the events leading up to the vote in San Antonio. A few people decided what information went to the delegates. Even the General Conference’s “Study of Church Governance and Unity” document pointed out that Ellen White was upset when “‘two or three men’” tried to control the church’s mission or when “‘merely a half a dozen’ at the world headquarters” sought “‘to be a ruling and controlling power.’” The “Study” document was correct in its use of that inspired material. But it was dead wrong when it claimed that what happened in the late 1800s “is a world away from the situation today.”89 It was actually the same situation and dynamic, with a few people in their decision-making capacity controlling information and events. As a result, from the perspective of Ellen White’s writings, we do not have a voice of God vote from the world church in 2015. Instead, we have the same old manipulation and kingly power approaches that she detested in 1888 and the 1890s. And the manipulation was not merely of data, but also of process. Here one example must suffice. The General Conference documents uplift the Acts 15 conference “almost as much for its process as for the theological decision that resulted,” but that appreciation was not evident in San Antonio. For one thing, the General Conference documents do not describe the Acts 15 process. Rather, they infer that the process was voting to be followed by mandatory obedience.90 But Acts 15 outlines not only the actual process but also the essential tipping point in that process. The breakthrough in Acts 15 truly was based on process and came when Peter was able to demonstrate that the Holy Spirit made no distinction between Jews and Gentiles but came in the same way to both groups (Acts 15:8, 9). Without that evidence there would have been nothing but ongoing divisiveness. But with it there was healing and unity. What would have happened in San Antonio if the process utilized in Acts 15 had been used on the day of the vote. There would have been testimonies from people put on the program that demonstrated that the Holy Spirit fell upon the pastoral/evangelistic ministries of women in the same way as for men. Such testimonies were important in the final TOSC meeting and helped lead to a significant majority of the participants, despite their personal position on women’s ordination, to approve flexibility in the practice of ordaining women.91 But the few people who set up the procedure in San Antonio chose not to follow the Acts 15 model even though the “Study of Church Governance” documents cite that passage to bolster the General Conference’s authoritative position. His wife was of the same opinion. “The church may pass resolution upon resolution to put down all disagreement of opinions,” she penned in 1892, “but we cannot force the mind and will, and thus root out disagreement. These resolutions may conceal the discord, but they cannot quench it and establish perfect agreement.”93 From her perspective, only the clear word of Scripture could bring true unity. Another fascinating insight comes from the Testimonies. In that quotation we find some excellent advice for Adventist decision makers as they approach the 2017 Annual Council. So Where Are We in 2017? Since the problem that has developed in the past few years is over women’s ordination, I should briefly comment on the topic. It is not prohibited in the Bible. It is not prohibited in Ellen White’s writings. It is not a settled issue because of the suppression of information and the manipulation of the process in 2015. Its practice will not stop because there is no biblical evidence for doing so. Its prohibition cannot be settled by a vote alone. Adventist leaders need to refrain from seeking to use policy as if it were Catholicism’s Canon Law. We need to remember that Adventism is post-Reformation. It is true that in 1990 the denomination officially voted not to ordain women to the gospel ministry because of “the possible risk of disunity, dissension, and diversion from the mission of the church.”97 That vote, we should note, did not claim that the practice was wrong. It was not a theological vote, but one based on the practical grounds that it might cause disunity. That was 27 years ago and the denomination has discovered that unity can be fractured in more than one direction. The plain fact in 2017 is that the church is seriously divided on women’s ordination. But it probably would not be if the conclusions generated by the TOSC committee had not been suppressed at San Antonio, if the process in Acts 15 had been utilized at the session, and if the General Conference leadership would have used the findings of TOSC as a tool to bring unity and healing to the church. But that healing approach did not take place. As a result, a small group at denominational headquarters decided to exert what it believed to be its authority in September and October 2016, months that witnessed the apex of the evolution of Adventist ecclesiological authority and the continuation of the problematic results that both James and Ellen White had predicted from the use of such authority. The initial September recommendation, formulated in the presidential offices, utilized the Working Policy rulings developed in the 1980s and 1990s to centralize authority. Especially important was B 95, voted into policy at the 1995 session, which authorized the “dissolution” of noncompliant union conferences that were not in harmony with General Conference policy. That initial document, whose basic content was leaked to Spectrum, urged the disbanding of the offending unions and reconstituting them as missions attached to the General Conference. That way the union leaders could be removed and replaced and constituency meetings could be called to reverse the ordination votes.98 My sources, many of whom requested confidentiality in the present intimidating and threatening denominational climate,99 tell me that the initial proposal, which did not have widespread input, was withdrawn and all copies were collected by the General Conference president. To put it bluntly, the General Conference presidential offices, had to step outside of policy to make its case for punishing those it deemed to be outside of policy. After all, the Working Policy spells out in unmistakable language that dissolution of unions must begin at the division level. But if the division is not likely to come up with the “proper” answer, alternatives must be used. The selected alternative, in this case, was for presidential to step outside of policy to accomplish the task. So we have a case of blatant noncompliance with the Working Policy to punish noncompliance. Obviously, what is needed is a new policy that allows the General Conference president to initiate actions against anybody deemed deserving of such attention. Such a policy, of course, would be a major step toward papalism and unrestricted kingly power. That rather pregnant thought brings us to 2017, during which the Annual Council is to act on the fate of those lower rungs in the organization who are to be dealt with for their own noncompliance on women’s ordination. To put it mildly, the leadership of the General Conference has backed itself into an extraordinary situation in the evolution (or revolution) in Adventist authority. With those thoughts in mind we need to remember that the medieval Catholic Church never viewed itself as persecuting anybody. It was just making sure that people were in line with Canon Law, its version of the Working Policy. Along that line, we need to remember that part of James White’s strategy in getting Adventists to organize in the first place was to help them see that the biblical use of the word “Babylon” not only signified persecution, but also confusion. White sold them on the second meaning. But it appears that the denomination is now intent on resurrecting the first. Of course, given the noncompliance of the General Conference with its own policy, perhaps both meanings are in evidence in 2017. The only basis for Christian unity is Scripture, trust, and the love of God. It is God who calls pastors. All the church can do is to recognize God’s call by the laying on of hands. Ordination is not a biblical topic. (The passages using the word in the KJV generally mean to appoint or consecrate.) From the position of the Bible there is absolutely no difference between ordaining and commissioning. For Adventists the Bible is the only source for doctrine and practice. An appeal to policy is not an appeal to the Bible. A vote by a General Conference session is not equivalent to Bible evidence. The so-called noncompliant unions are not out of harmony with the Bible. Adventism has moved at times from being a church based on Scripture to one based on tradition and ecclesiastical pronouncements. The General Conference leadership in 2017 is coming dangerously close to replicating the medieval church in its call for the serious discipline of large sectors of the church on the basis of a non-biblical issue. 9. 1. The recent General Conference documents and procedures do not reflect faithfulness to the Bible’s teachings in Acts 15 or Matthew 18. 9.2. Due to the suppression of data and the manipulation of the events surrounding the voting process, I do not believe that the 2015 vote on women’s ordination indicated the voice of God. 9.3. One of the important functions of the ancient Hebrew prophets was to confront priests and kings over their abuse of authority. One of the functions of Ellen White was to confront conference presidents for similar reasons. And, if there were a prophet in modern Adventism, that prophet would find plenty to do. 9.4. The current atmosphere of confrontation in Adventism has not been brought about by the unions, but by the General Conference leadership and it’s non-biblical and manipulative tactics. 9.45. The October 2017 meetings may help the worldwide Adventist Church decide whether it wants to move more toward an Adventist Ecclesiology or toward a more Roman Catholic variety. “Lebanese University Encouraged to Reach Middle East through Medicine,” Adventist News Network, May 9, 2017. Heiko A. Oberman, Luther: Man Between God and the Devil (New York: Image Books, 1992), 204. Ellen G. White, The Great Controversy (Mountain View, CA: Pacific Press, 1911),126. James White, “The Gifts of the Gospel Church,” Review and Herald, April 21, 1851, 70. Secretariat, General Conference of SDA, “Summary of A Study of Church Governance and Unity,” Sept. 2016, 5; Secretariat, General Conference of SDA, “A Study of Church Governance and Unity,” Sept. 2016, 13. Ellen G. White, The Acts of the Apostles (Mountain View, CA: Pacific Press, 1911), 196; Ellen G. White, The Story of Redemption (Washington, DC: Review and Herald, 1947), 304-306, 308-309. Paul also raises the issue in 1 Cor. 8 and most likely in Rom. 14, but 1 Cor. 10 is the most explicit passage on the topic. Secretariat, “Summary,” 6, cf. 4; Secretariat, “A Study,” 12. Francis D. Nichol, ed. The Seventh-day Adventist Bible Commentary (Washington, DC: Review and Herald, 1953-1957), 5:448. Ellen G. White, Testimonies for the Church (Mountain View, CA: Pacific Press, 1948), 7:263. Russell L. Staples, “A Theological Understanding of Ordination,” in Nancy Vyhmeister, ed., Women in Ministry: Biblical and Historical Perspectives (Berrien Springs, MI: Andrews University Press, 1998), 139; see also Darius Jankiewicz, “The Problem of Ordination: Lessons from Early Christian History, “ in Graeme J. Humble and Robert K. McKiver, eds., South Pacific Perspectives on Ordination: Biblical, Theological and Historical Studies in an Adventist Context (Cooranbong, NSW: Avondale Academic Press, 2015), 101-129. See, e. g., Titus 1:5; Mark 3:14; John 15:16; Acts 1:22; 14:23; 16:4. See E. G. White, Acts of the Apostles, 161-162. G. White to Brethren who shall assemble in General Conference, Aug. 5, 1888. Ellen G. White, Colporteur Ministry (Mountain View, CA: Pacific Press, 1953), 125. For more on this topic, see George R. Knight, “Visions and the Word: The Authority of Ellen White in Relation to the Authority of Scripture in the Seventh-day Adventist Movement,” in Robert L. Millet, ed., By What Authority? The Vital Question of Religious Authority in Christianity (Macon, GA: Mercer University Press, 2010), 144-161. For a fuller treatment of the authority crisis in the events surrounding the 1888 General Conference session, see George R. Knight, Angry Saints (Nampa, ID: Pacific Press, 2015), 121-140. I. Butler to E. G. White, Oct. 1, 1888; E. G. White to Mary White, Nov. 4, 1888; E. G. White to M. H. Healey, Dec. 9, 1888; Cf. E. G. White to G. I. Butler, Oct. 14, 1888. G. White, “Light in God’s Word,” MS 37, 1890. Minneapolis Tribune, Oct 18, 1888, 5; E. G. White, “Love, the need of the Church,” MS 24, 1892; Minneapolis Journal, 18, 1888, 2; italics supplied. G. White, Great Controversy, 289-290; italics supplied. G. White, Acts of the Apostles, 161-162; italics supplied. G. White, Story of Redemption, 304. See Catechism of the Catholic Church: With Modifications from the Editio Typica (New York: Image, 1995), 433-437; Jarislav Pelikan, The Riddle of Roman Catholicism (Nashville: Abingdon, 1959), 84, 124-125; Richard P. McBrien, Catholicism, study edition (San Francisco, Harper & Row, 1981), 558-559, 846-847. The Roman Catholic Church, for example, only has two levels of authority above the local congregation. Joseph Bates and Uriah Smith, “Doings of the Battle Creek Conference, Oct. 5 & 6, 1861,” Review and Herald, 8, 1861, 148. George Storrs, “Come Out of Her My People,” The Midnight Cry, Feb. 15, 1844, 237-238. Charles Fitch, “Come Out of Her, My People” (Boston: J. V. Himes, 1843). See George R. Knight, William Miller and the Rise of Adventism (Nampa, ID: Pacific Press, 2010), 228-250. James White, “Yearly Meetings,” Review and Herald, July 21, 1859, 68. John Byington and Uriah Smith, “Report of General Conference of Seventh-day Adventists” Review and Herald, May 26, 1863, 204-206. James White, “Organization,” Review and Herald, Aug. 5, 1873, 60. “Sixteenth Annual Session of the General Conference of S. D. Adventists,” Review and Herald, Oct. 4, 1877, 106; italics supplied. G. White, “Board and Council Meetings,” MS 33, [no date] 1891. G. White to Men Who Occupy Responsible Positions, July 1, 1896. G. White, “Regarding the Southern Work,” MS 37, April 1901. Barry David Oliver, SDA Organizational Structure: Past, Present and Future (Berrien Springs, MI: Andrews University Press, 1989), 98-99. For the best treatment on this reorganization, see Oliver, SDA Organizational Structure. A. Olsen to A. T. Robinson, Oct. 25, 1892; see George R. Knight, Organizing for Mission and Growth: The Development of Adventist Church Structure (Hagerstown, MD: Review and Herald, 2006), 78-80 for the sequence of events. G. White, “Regarding Work of General Conference,” MS 26, Apr. 3, 1903; italics supplied. Gerry Chudleigh, Who Runs the Church? Understanding the Unity, Structure and Authority of the Seventh-day Adventist Church (n.p. : AdventSource, 2013), 18; italics supplied. E. G. White to the General Conference Committee and the Publishing Boards of the Review and Herald and Pacific Press, Apr. 8, 1894; see also E. G. White, Testimonies, 9:259- 260. G. Daniells, European Conference Bulletin, 2, cited in Oliver, 320. Oliver, 317 n. 2, 341. George I. Butler, Leadership [Battle Creek, MI: Steam Press, 1873], 1, 8, 11, 13. See, e. g., [James White] in a series entitled “Leadership” that ran in the Signs of the Times from June 4, 1874-July 9, 1874; E. G. White, Testimonies, 3:492-509. A. B. Oyen, “Sixteenth Annual Session of the General Conference of S. D. Adventists,” Review and Herald, Oct. 4, 1877, 106. Kevin M. Burton, “Centralized for Protection: George I. Butler and His Philosophy of One-Person Leadership,” MA Thesis, Andrews University, 2015. I. Butler to E. G. White, Oct. 1, 1888; E. G. White to G. I. Butler, Oct. 14, 1888. See Knight, Angry Saints, passim. E. G. White to the General Conference Committee and the Publishing Boards of the Review and Herald and Pacific Press, Apr. 8, 1894; D. T. Jones to J. D. Pegg, Mar. 17, 1890; D.
T. Jones to W. C. White, Mar. 18, 1890. E. G. White to Elder Daniells and His Fellow Workers, Apr. 12, 1903. Chudleigh, Who Runs the Church? 31. Stanley E. Patterson, “Kingly Power: Is It Finding a Place in the Adventist Church?” Adventist Today, Sept.-Oct. 2012, 5; Chudleigh, Who Runs the Church? 32-33; Working Policy of the General Conference of Seventh-day Adventists, 1999-2000 edition (Hagerstown, MD: Review and Herald, 2000), 125-126. Rosmary Watts, “North Pacific Reasserts Constitutional Independence,” Spectrum, February 1987, 29-33. Wilson’s letter is found as an appendix on pages 31-33. “Church Leaders Favor Model Constitutions,” Adventist Today, May-June 1995, 19; “Administration Seeks Greater Control,” Adventist Today, Nov.-Dec. 1994, 23, 26. Susan S. Sickler to George R. Knight, Feb. 27, 2017; Bert Haloviak to George R. Knight, Mar. 7, 2017; “Administration Seeks Greater Control,” 26. Designated in the Working Policy as B 45 in earlier post-1995 editions but now as B 95. Susan S. Sickler to George R. Knight, Feb. 27, 2017; “Administration Seeks Greater Control,” 23, 26. See “Administration Seeks Greater Control,” 26. Ibid., 23; Susan S. Sickler to George R. Knight, Feb. 27, 2017. “General Conference Theology of Ordination Study Committee Report, June 2014,” 3-7. An examination of the committee membership list reveals that a large portion, if not the majority, were not scholars. Secretariat, “A Study of Church Governance,” 41; Secretariat, “Summary of A Study,” 14. As will be noted below, many of the TOSC participants were disillusioned when the General Conference president reversed his opinion on the importance of the committee from its first meeting, when it looked as if it would come up with the “proper” answer, to its last, in which the majority voted against his position. This point needs further investigation into the 13 division reports. Nine divisions in favor of diversity is the lowest number I have come across. Some sources report 11 and others 12 divisions in favor of flexibility. Norwegian Union Conference, “A Response to ‘A Study of Church Governance and Unity,’” Oct. 4, 2016; See William G. Johnsson, Where Are We Headed? Adventism after San Antonio (Westlake Village, CA: Oak and Acorn Publishing, 2017), 153-161 for a published version of the document. Recollections of several participants who wish to remain anonymous. See, e.g., George R. Knight, “The Role of Union Conferences in Relation to Higher Authorities,” Spectrum (44:4, 2016), 40. Secretariat, “Summary of A Study,” 14; Secretariat, “A Study,” 40, 41; see also Barry Oliver to George R. Knight, Feb. 20, 2017. Johnsson, Where Are We Headed? 1. G. White to G. I. Butler, Oct. 14, 1888. Secretariat, “Summary of A Study,” 5; Secretariat, “A Study,” 13; italics supplied. See also Mark A. Finley, “United in Message, Mission, and Organization,” Ministry, April 2017, 14. James White, “Leadership,” Signs of the Times, June 4, 1874; italics supplied. G. White, “Love, the need of the Church,” MS 24, 1892. Ellen G. White, Special Testimonies: Series A (Payson AZ: Leaves-of-Autumn, n.d.), 299-300; italics supplied. G. White, Testimonies, 9:277-278; italics supplied. See Working Policy, L 35, L 50. The sexist language in these sections is not a voted policy, but an editorial decision in the 1980s. See Knight, “The Role of Unions,” 41: Gary Patterson, untitled critique of the Secretariat’s paper on “Unions and Ordination,” 1. “Session Actions,” Adventist Review, July 13, 1990, 15. See, e.g., Bonnie Dwyer, “General Conference Leadership Considers Takeover of Unions that Ordain Women,” Sept. 29, 2016, https://spectrummagazine.org/article/2016/09/29/general-conference-leadership-considers-takeover-unions-ordain-women. Most of my sources have requested confidentiality, given the intimidating atmosphere in the General Conference building, in General Conference institutions, and among other denominational employees who have hopes for a future in the upper realms of the denomination. In fact, intimidation and threats in matters related to finances and funding have been in the “air” emanating from Silver Spring. It is no accident that no professors from Andrews University or its theological seminary are participating in this conference. “Kingly power” is alive and well. It is fortunate that those of us who are retired are beyond that intimidating authority. For one perceptive critique, see Norwegian Union Conference, “A Response to ‘A Study of Church Governance and Unity,’” Oct. 4, 2016. James White, “Leadership,” Signs of the Times, July 9, 1874, 28. James White, “Leadership,” Review and Herald, June 17, 1880, 392. Quoted in Johnsson, Where Are We Headed? 74. Even a casual reader will discover that, like Luther, I have had a bit of a challenge keeping the number of theses from expanding–thus the 9.1 and 9.2 maneuver, so that I could maintain the 9.5 symbolism. Seventh-day Adventist Church Manual, 16th (Hagerstown, MD: Review and Herald, 2000), 27; italics added. See George R. Knight, “Ecclesiastical Deadlock: James White Solves a Problem that Had No Answer,” Ministry, July 2014, 9-13; George R. Knight, “James White finds the Answer,” in John W. Reeve, ed., Women and Ordination: Biblical and Historical Studies (Nampa, ID: Pacific Press, 2015), 113-120. G. White, The Great Controversy, 160. This paper was originally presented at the 2017 Unity Conference in London, England, June 15-17, 2017. The latest issue of Spectrum features all of the Unity Conference papers. If you are not yet a subscriber to Spectrum, click here to find out how you can become one today.